This is accomplished by a simple behind-the-scenes recognition: the web page URLs for ChemSpider structures follow a consistent format, which includes the ChemSpider ID for the structure. So the back-end server for ODDT uses a regular expression to pull out the ID, and recomposes it into an adjunct link that goes directly to the MDL Molfile download link. The mobile app client recognises the MIME type for the structure, and goes off to download it, which is why it is able to be displayed inline. The molecule picture is interactive, too: you can tap on it to take a closer look, and open it with othe apps that know how to deal with .mol files. 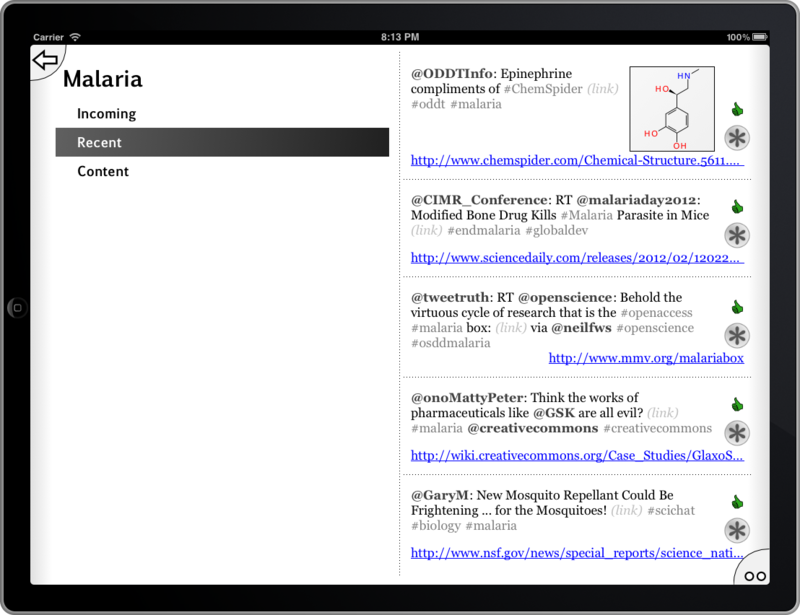 Both the machine-readable content of the structure, and all the rest of the trappings that come along with the ChemSpider page, are available. This feature works in the same way as when chemical data is tweeted out from the MolSync app, the results of which can be acquired and parsed directly, or rendered within the container page.